Bathroom granite countertops are thing these days, yet not every homeowner believes. In fact, granite countertops Dallas has been here for years, providing astounding benefits in households. 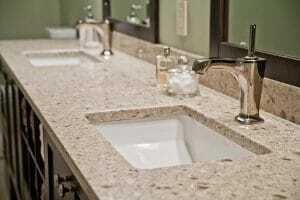 There are plenty of reasons to install granite countertops in bathroom. But if you are having doubts, then try reading this article all the way to the end. Hopefully, you will learn what makes this countertop material a great steal and, more importantly, how it can transform your bathroom into an inviting area. Make sure to keep them in mind! Extreme durability is one of the most recognized benefits of granite. People often forget about the impact that their daily routine can have on bathroom countertops. Granite is nearly indestructible. It survived the test of time in its natural environment of harsh earthly elements. Its hardness ranks second to the hardness of a diamond. Granite countertops will have no trouble standing up to the demands of your morning routine. Hot tools and styling products will pose no threat to granite’s naturally durable crystalline structure. Maintain your granite’s seal. This way you won’t need to worry about makeup or other products leaving a stain behind. Granite’s easy maintenance is one of the most recognized benefits. With everything that may happen in a countertop surface, there is one key aspect in selecting countertops. This is an ability to easily clean and disinfect the countertop surface. This is perhaps the most important consideration when selecting Dallas’ granite countertops for the bathroom. Their natural properties make it incredibly easy to clean and disinfect. Just use warm soapy water, baking soda, or your favorite non-acidic multi-surface cleaner. Your countertops will be gleaming like new. You can also easily seal your countertops to maintain natural luster and prevent stains. One of the many features of granite is its ability to provide your bathroom with a fresh new look. In addition, each slab of granite is different than the next, meaning no two slabs will look exactly alike. This adds texture, pattern, and color variance. Furthermore, even though the basic color of your countertop will be the same, for instance blue, you may notice that there are different shades throughout even the same slab of granite. Again, this adds more depth and blends well with any décor style. Are now convinced with the prowess of bathroom granite countertops? Contact us here at Hard Rock Imports. We provide premium-grade granite countertops at affordable prices. Give us a call today and acquire a no cost, no obligation estimate!